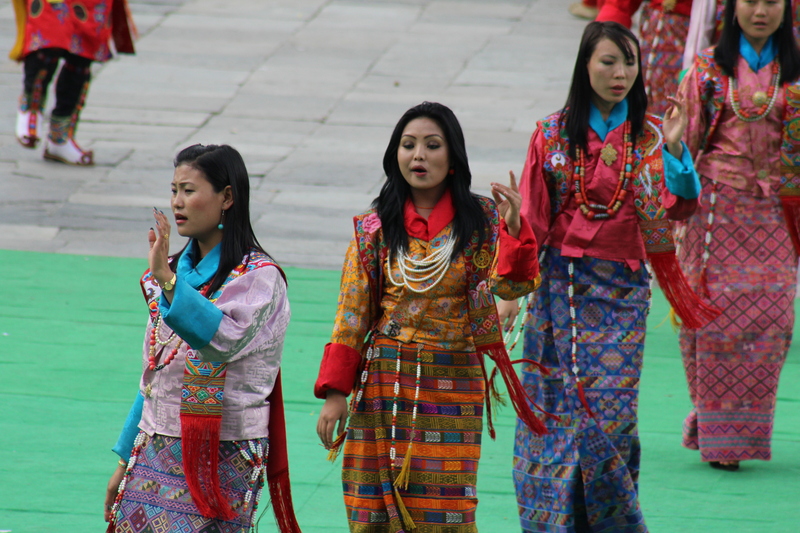 One of the unique identities of Bhutan is the national dress that men and women wear. Men wear a “Gho” which is almost like a bathrobe that is lifted to the knee and tied on the waist with a beautifully woven belt “Kera”. Women’s dress is called “Kira” that is an intricately woven textile piece about the size of a bed cover. It is wrapped around the body and held onto shoulders with gold plated silver broach. The upper jacket worn is called the “Tego” which is mostly made out of silk. All citizens are required to wear the national dress in official gathering, religious or public festivals, government offices, temples, schools and other formal gatherings. Visitors can dress according to their own choice. You are advised to avoid wearing too short shorts, low cut shirts and any kind of dress that expose or reveal. However, when attending any of these formal events and festivals, or while entering offices, and some of the temples and monasteries, full sleeve shirt and full pants or full skirt may be be required. You will be asked to remove hats, umbrella. While visiting a temple or monasteries and when you enter a shrine, you will be also required to remove shoes and hats. Some of the shrines may have cold floors and therefore we recommend a warm thick socks for it. Formal dress as such is not required for a holiday in Bhutan.